* Senior club appearances and goals counted for the domestic league only and correct as of 18 October 2015. Nigel Shola Andre Reo-Coker (born 14 May 1984) is an English footballer who most recently played for Montreal Impact in Major League Soccer. He came through the youth team ranks at Wimbledon, and has previously played for West Ham United, Aston Villa, Bolton Wanderers, Ipswich Town, Vancouver Whitecaps FC and Chivas USA. Reo-Coker was born in Sierra Leone. As a child, he spent six years in the country, where his father, Ransford, was a doctor. Nigel moved back to London with his mother Agnes-Lucinda and sisters Natalie and Vanessa when his parents split up in 1990. As a child he attended Riddlesdown High School in Purley. Reo-Coker was spotted by London club Wimbledon at the age of twelve after representing the borough of Croydon. He came through the ranks at Wimbledon and became captain after progressing to the first team. He also made his debut for the England Under-21s while at Wimbledon. In March 2003, Portsmouth manager Harry Redknapp agreed a deal to bring Reo-Coker to the south coast club in preparation for their first Premiership season. Financial problems resulted in the player remaining at Wimbledon despite having already signed contracts with Portsmouth. Reo-Coker made 64 appearances for Wimbledon in all competitions, scoring six goals. Reo-Coker during his West Ham days. After an impressive first half of the 2003–04 season, he signed for West Ham in January 2004. After the move, Reo-Coker stated that he joined West Ham United, believing the club can bounce back to the Premier League. He made his West Ham debut on 31 January 2004 in a 2–1 home win against Rotherham United. His first West Ham goal came on 9 March 2004 against his former club, Wimbledon as he scored the fifth goal in a 5–0 win. He quickly became a regular member of Alan Pardew's first team and was made the club captain. In his first season West Ham made the 2004 Football League First Division play-off Final but lost 1–0 in Cardiff to Crystal Palace. In his second season he scored three times and played 39 games from a possible 46 games to help the club win promotion to The Premier League in 2004–05 through the play-offs and led the team to the FA Cup Final in May 2006. The 2006–07 Premiership campaign began less successfully for West Ham, and Reo-Coker was singled out by some groups as being the main culprit for this slump, which left West Ham perilously close to the bottom three and ultimately led to the sacking of manager Alan Pardew. New manager Alan Curbishley identified Reo-Coker as being part of the team which had lost direction and was in danger of being relegated back to The Championship. Reo-Coker recovered his form in the latter part of the season and a run of seven wins in nine games, inspired by Carlos Tevez, saw West Ham escape relegation on the last day of the season with a 1–0 win at Manchester United, which turned out to be Reo-Coker's last game for West Ham. Reo-Coker intended to sort his future out in the summer before the 2007–08 season, saying in May 2007, "I do not know what my future is and need to sit down and talk with the manager and the chairman this week. I have been through the mill this season, but it has made me a stronger person and I would not have changed anything. I am a very loyal person but to play at my best I need to be happy. I made a promise to West Ham fans that I would help keep this club in the Premier League and I have done that." Reo-Coker requested a transfer at the end of the 2006–07 season after the board failed to reassure him concerning his future at West Ham. Aston Villa were reported to have made a £7m bid for Reo-Coker in June and in July 2007, West Ham and Aston Villa reached an agreement in the region of £8.5 million for the signing of Reo-Coker. Reo-Coker made 142 appearances in all competitions for West Ham scoring 11 goals. He was also booked 33 times. Warming up with John Carew. Reo-Coker joined Aston Villa on 5 July 2007 for a reported £8.5 million, signing a four-year deal. At the press conference following the signing, he spoke of being "hung out to dry" by his former club, West Ham United, and said that his reason for joining Villa was, "their aspiration to play in Europe; they have a talented squad and Martin O'Neill has told me what he aims to do and I believe we can achieve it." 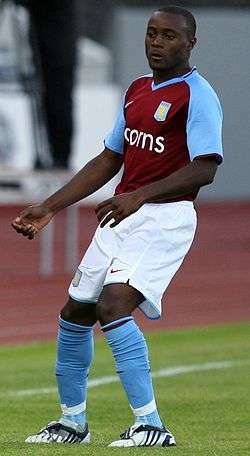 Reo-Coker scored his first goal for Villa in a 5–0 League Cup 2nd round victory over Wrexham on 28 August 2007. On 21 January 2008, Reo-Coker captained Aston Villa in the absence of regular captain Gareth Barry against Liverpool at Anfield. He scored his first Premier League goal for Aston Villa in a 2–1 win over Tottenham at White Hart Lane. He then scored again later that week to equalise for Villa in the UEFA Cup against Litex Lovech. Villa went on to win this game 3–1. During his time at Villa, Reo-Coker has been known to operate as a right-back and right-winger occasionally when players who would usually play in those positions are unavailable. Reo-Coker captained Aston Villa in the latter stages of the 2009 Peace Cup, following an injury to teammate Stiliyan Petrov. This was the case in the final, as Villa were triumphant and Reo-Coker consequently lifted the trophy. Reo-Coker would re-establish himself as a regular starter in the Villa team following the departure of Gareth Barry. However, on 18 September 2009, he was involved in a training ground bust up with manager Martin O'Neill and dropped for the following day's match with Portsmouth. A few week later, Reo-Coker was recalled by O'Neill, having being called ahead of a match. Reo-Coker enjoyed a resurgence at the start of the 2010–11 season under new Villa manager Gérard Houllier and following news in October 2010 that captain Petrov would be out injured for two months, Houllier named Reo-Coker as captain until Petrov's return. On 27 May 2011, Aston Villa announced that Nigel Reo-Coker had left the club following his contract expiring. After being released, Reo-Coker would accuse the club's chief over his release. Reo-Coker joined Bolton Wanderers in July 2011 on a free transfer following his release from Villa, signing a two-year deal. Manager Owen Coyle described him as having the "...quality, drive and desire to compete at the highest level in the Premier League..." He made his debut in the 4–0 away win at Queens Park Rangers in the next month and scored his first goal for the club in Bolton's 2–1 away win against Blackburn Rovers in December 2011. He went on to make 42 league and cup appearances for Bolton, scoring three goals. Bolton struggled during the 2011-12 season and following relegation from the Premier League at the end of the season, Reo-Coker activated a release clause in his contract and left the club. Reo-Coker joined Ipswich Town in October 2012, saying, "Ipswich are a sleeping giant in the Championship — a massive club with a great history. It's the right club at the right time for me and everything has fallen into place." He made twelve appearances before departing the club in January 2013 after turning down the offer of an extended contract until June 2013. On 20 February 2013, Reo-Coker accepted an offer from MLS club Vancouver Whitecaps FC. Reo-Coker's Discovery Rights had been held by the Whitecaps' local rivals Portland Timbers, but Reo-Coker expressed a desire to play for the Vancouver club instead having been impressed with the professionalism of Vancouver head coach Martin Rennie. Vancouver traded its second-round picks in the 2014 MLS SuperDraft and 2015 MLS SuperDraft to Portland in exchange for the right to sign Reo-Coker. Reo-Coker made his debut for the club in a 1-0 win over Toronto on 3 March 2013, where he made 38 passes in the 45 minutes played, misplacing just eight of the total 46 during the match. Reo-Coker soon became known for his tough-tackling following a match against San Jose Earthquakes, in which he flipped midfielder Sam Cronin with a tackle in front of the referee. Reo-Coker was given a warning for the tackle. On 27 April 2013, Reo-Coker was awarded Man of the Match for his performance. Reo-Coker scored his first ever MLS goal in a 4-1 win over Seattle Sounders on 9 October 2013. Ahead of the 2014 season Reo-Coker changed his squad number from 13 to his favoured number 20 that he has worn at both West Ham and Aston Villa in England. On 21 August 2014, Reo-Coker was traded to MLS club Chivas USA for Mauro Rosales. Following the league's decision to fold the club following the 2014 MLS season, Reo-Coker was made available for the 2014 MLS Dispersal Draft. He was not selected. Reo-Coker was drafted by Montreal Impact in the MLS Waiver Draft on 10 December 2014. His contract was terminated by mutual consent on 21 January 2016. Reo-Coker was first selected for the England U-21 squad against Turkey in October 2003. On 24 March 2007, Reo-Coker led out England Under 21s against Italy Under 21s, becoming the first Englishman to captain a side at the new Wembley Stadium. The match finished 3–3. In May 2006, Reo-Coker was named as the standby midfield player for England's 2006 World Cup squad. However, on 22 May the FA announced that Reo-Coker would be replaced by Phil Neville as Reo-Coker's back problems made him unable to compete in the World Cup. He captained the England U21s throughout the 2007 UEFA Under-21 Championship. A second booking in the tournament received needlessly in the semi-final against the hosts, the Netherlands, meant he would have missed the final if England had progressed. Due to his age, it also meant that the match would be his final game for the team. The semi-final went to penalties and the Netherlands eventually won 13–12, with Reo-Coker's penalty being saved in the shootout. Reo-Coker is of Sierra Leonean descent and has stated that he would consider any future call-ups to the West African nation. In May 2010, Sierra Leone Football Association president Nahim Khadi announced that his interest in inviting Reo-Coker to join up with the Sierra Leone national football team for their 2014 FIFA World Cup qualification campaign. Khadi said that the player's great "leadership and experience" would be a great asset to the team. On 20 September 2010, it was revealed that Sierra Leone manager Christian Cole had decided to pencil Reo-Coker in to his squad for the 2012 Africa Cup of Nations qualifying match against South Africa. However, Reo-Coker later rejected the chance to represent the nation, claiming that he wished to concentrate on his football at Aston Villa and maybe even return to the England set-up in the future. ↑ "Premier League Player Profile". Premier League. Retrieved 11 March 2011. ↑ "My Family Values". The Guardian. 16 May 2009. Retrieved 23 April 2015. ↑ "The Big Interview: Nigel Reo Coker". The Times. London. 7 May 2006. Retrieved 3 June 2007. 1 2 "Nigel Reo-Coker: 'It annoys me when...". London: The Independent on Sunday. 11 February 2006. Retrieved 3 June 2007. ↑ Burt, Jason (18 January 2004). "Hot property Reo-Coker has to sweat it out". The Independent on Sunday. Retrieved 15 August 2015. ↑ "Reo-Coker hopes to impress". BBC Sport. 7 October 2003. Retrieved 3 June 2007. ↑ "Pompey agree Reo-Coker fee". BBC Sport. 16 June 2003. Retrieved 3 June 2007. ↑ "Pompey concede Dons duo defeat". BBC Sport. 8 August 2003. Retrieved 3 June 2007. ↑ "Nigel Reo-Coker". Soccerbase. Retrieved 11 June 2007. ↑ "Reo-Coker agrees Hammers terms". Sky Sports. 20 January 2004. Retrieved 22 April 2013. ↑ "Reo-Coker pleased with move". Sky Sports. 22 January 2004. Retrieved 22 April 2013. ↑ Plummer, David (2 February 2004). "Pardew buoyed by Dailly blessing". The Guardian. Retrieved 4 April 2012. ↑ "West Ham 5–0 Wimbledon". BBC Sport. Retrieved 4 April 2012. ↑ "Crystal Palace 1 West Ham 0". Sporting Life. 29 May 2004. Retrieved 4 April 2012. 1 2 3 "Welcome to the Wonderful World of West Ham United Statistics Nigel Reo-Coker". westhamstats.info. Retrieved 4 April 2012. ↑ "West Ham 1–0 Preston". BBC Sport. Retrieved 4 April 2012. 1 2 "Liverpool 3–3 West Ham". BBC Sport. Retrieved 4 April 2012. ↑ Reo-Coker subjected to hate mail, BBC, 19 December 2007. Retrieved 5 June 2007. ↑ West Ham boss defends Reo-Coker, BBC, 7 January 2007. Retrieved 5 June 2007. ↑ West Ham 'need a bit of luck', says Reo-Coker, The Independent, 31 January 2007. Retrieved 3 June 2007. ↑ Reo-Coker reveals West Ham doubts, BBC, 13 December 2006. Retrieved 3 June 2007. ↑ Ashton, Neil (3 January 2007). "Curbs must drive out his Baby Bentley boys". Daily Mail. Retrieved 4 April 2012. ↑ Magnusson hails West Ham survival, BBC, 14 May 2007. Retrieved 5 June 2007. ↑ "Siege mentality saved West Ham...", The Times, 14 May 2007. Retrieved 3 June 2007. ↑ "Reo-Coker Fee Agreed", Official Aston Villa FC Website, 4 July 2007. Retrieved 4 July 2007. ↑ "Villa complete Reo-Coker signing", BBC Sport, 5 July 2007. Retrieved 5 July 2007. ↑ "Villa complete Reo-Coker signing", BBC Sport, 5 July 2007. Retrieved 17 July 2007. ↑ "Wrexham 0–5 Aston Villa". BBC. 28 August 2007. Retrieved 3 September 2009. ↑ " Tottenham 1–2 Aston Villa", BBC Sport, 15 September 2008. Retrieved 15 September 2008. ↑ "Litex Lovech 1–3 Aston Villa". BBC. 18 September 2008. Retrieved 2 September 2009. ↑ Bill Howell (3 August 2009). "Sport – Aston Villa – Aston Villa FC news – Aston Villa 4 Juventus 3 – Bill Howell's pre-season verdict". Birmingham Mail. Retrieved 27 July 2011. ↑ "Reo-Coker dropped and sent home". BBC News. 18 September 2009. Retrieved 20 May 2010. ↑ "Reo-Coker back for Villa". Sky Sports. 25 September 2009. Retrieved 22 April 2013. ↑ "Reo-Coker named temporary captain of the claret and blue troops | Aston Villa". Avfc.co.uk. Retrieved 27 July 2011. ↑ "Farewell to Reo-Coker and Carew as released list announced". Aston Villa F.C. 27 May 2011. Retrieved 27 May 2011. ↑ "Reo-Coker blasts Villa snub". Sky Sports. 9 July 2011. Retrieved 22 April 2013. ↑ Midfielder handed two-year deal at Reebok Stadium (14 May 2011). "Reo-Coker seals Bolton move | Bolton Wanderers News, Fixtures, Results, Transfers". Sky Sports. Retrieved 27 July 2011. ↑ "Nigel Reo-Coker joins Bolton after Aston Villa release". BBC Sport. 27 July 2011. Retrieved 21 February 2013. 1 2 "Games played by Nigel Reo-Coker in 2011/2012". Soccer Base. Retrieved 21 February 2013. ↑ "Bolton Wanderers allow 15 players to leave after relegation". 18 May 2012. Retrieved 21 February 2013. ↑ "Reo-Coker free to leave Trotters". Sky Sports. 15 May 2012. Retrieved 20 October 2012. ↑ "Nigel Reo-Coker: Ipswich Town sign ex-Bolton midfielder". BBC Sport. 14 October 2012. Retrieved 15 October 2012. ↑ "Ipswich Town: Nigel Reo-Coker turns down extension". BBC Sport. 14 January 2013. Retrieved 21 February 2013. ↑ Watson, Stuart (12 January 2013). "Nigel Reo-Coker will not be staying at Ipswich Town". East Anglian Daily Times. Archant. Retrieved 12 January 2013. ↑ "Reo-Coker Accepts Whitecaps Offer". Prost Amerika. 19 February 2013. Retrieved 19 February 2013. ↑ "Whitecaps Set to Swoop for Reo-Coker". Prost Amerika. 14 February 2013. Retrieved 19 February 2013. ↑ "Timbers acquire 2014, 2015 SuperDraft picks from Vancouver". Portland Timbers. Retrieved 22 February 2013. ↑ "Nigel Reo-Coker actually did pretty well in his MLS debut". Lion of Vienna Suite. 3 March 2013. Retrieved 22 April 2013. ↑ "Reo-Coker gets away with horror tackle in MLS as Vancouver midfielder flips opponent". Daily Mail. 8 April 2013. Retrieved 22 April 2013. ↑ "Nigel gets away with horror tackle". The Sun. 8 April 2013. Retrieved 22 April 2013. ↑ Darcy Green (27 April 2013). "Whitecaps FC draw 2-2 versus FC Dallas | Vancouver Whitecaps FC". Whitecapsfc.com. Retrieved 4 April 2014. ↑ Farhan Devji (9 October 2013). "Manneh hat-trick propels Vancouver Whitecaps FC to historic 4-1 victory over Seattle Sounders FC | Vancouver Whitecaps FC". Whitecapsfc.com. Retrieved 4 April 2014. ↑ The Canadian Press (21 August 2014). "Nigel Reo-Coker traded from Whitecaps to Chivas USA". CBC.ca. Retrieved 18 November 2014. ↑ Reo-Coker hopes to impress, BBC, 7 October 2003. Retrieved 3 June 2007. ↑ A priceless moment, The FA.com, 25 March 2007. Retrieved 3 June 2007. ↑ "Eriksson gambles on Walcott", The Guardian, 8 May 2006. Retrieved 3 June 2007. ↑ Neville in for injured Reo-Coker, BBC, 22 May 2006. Retrieved 3 June 2007. ↑ "Holland U21 1–1 Eng U21 (aet)". BBC Sport. 20 June 2007. Retrieved 21 June 2007. ↑ Shopping blogger Emma Iannarilli (27 May 2010). "Nigel Reo-Coker in Sierra Leone call". Express & Star. Retrieved 27 July 2011. ↑ "Sierra Leone hopeful on Reo-Coker". BBC News. 20 September 2010. ↑ "Reo-Coker spurns Sierra Leone". Sky Sports. 23 September 2010. ↑ "West Ham 1-0 Preston". BBC Sport. Retrieved 26 April 2015. ↑ "Impact's CONCACAF Champions League trophy chances dashed after home defeat". The Globe and Mail. Retrieved 31 August 2016.